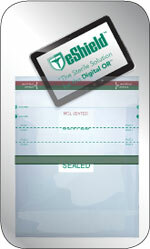 Tablets have become a valuable tool in the operating theater. Surgeons use tablets to access medical apps to plan surgery, look at images, view videos and consult with peers in real time on interesting or difficult cases. 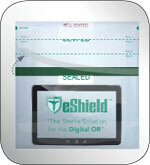 The first FDA approved sterile cover, eShield™ encloses tablets so they can be conveniently positioned for the surgeon’s direct control from the surgical table. 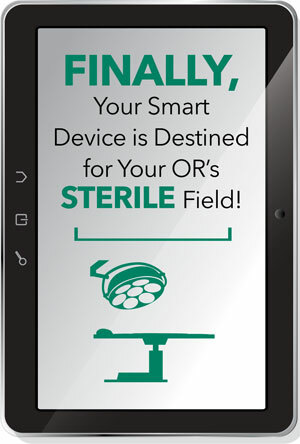 This real solution for a real problem gives surgeons immediate access to medical information at the point of care which can save time, reduce costs, errors, and optimize workflow in the operating room. 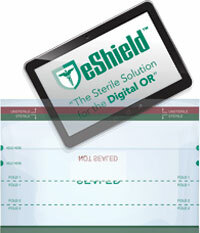 Enables use of surgical apps in the sterile field. 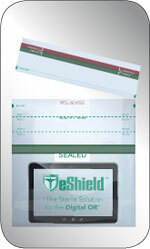 Optically clear polyethylene film for sharp photography. 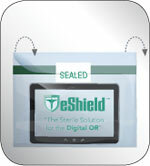 Nurses responsible for managing the OR can rest assured that the eShield™ will help reduce disruptions and protect the sterile field from contaminants on devices. 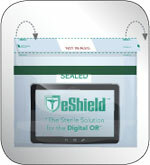 the eShield cover held by scrub person.